Below are listed the most amazing natural and man made landmarks of Peru. 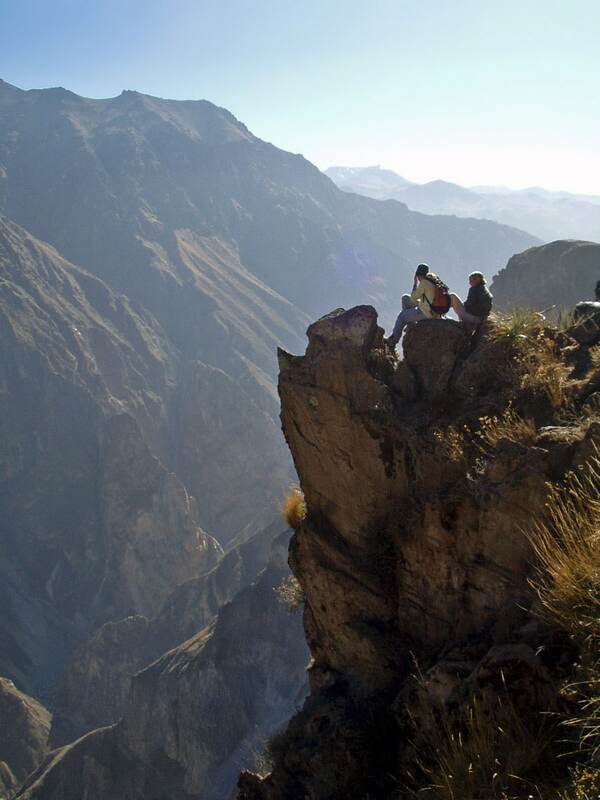 Colca Canyon and geysers – Arequipa. One of the deepest canyons in the world, up to 3,200 m deep (some sources give as much as 4,160 m). A location where soaring Andean Condors can often be seen. In the valley are located several geysers (?) and perpetual spouters. The best known is "Infiernillo" – a perpetual spouter. Cotahuasi Canyon – Arequipa. One of the deepest canyons in the world, up to 3,535 m deep. In some places the river is located in deep chasm, there have formed several spectacular waterfalls, such as the 150 m tall Sipia Falls. Pongo de Mainique – Cusco. 3 km long canyon of Urubamba River with 300 – 900 m high cliffs. The forest here has extremely high biological diversity, one of the highest in the world. The canyon is crossed by Inca bridge, leading to Machu Picchu. Pavirontsi Natural Bridge – Junín. One of the largest natural bridges in the world, approximately 192 m long, 30 m wide and 40 m high. Puente Bello with geysers – Moquegua. Group of perpetual spouters and geysers in magnificent location, where the river is crossed by a large natural bridge with road over it. One geyser reaches up to 25 m high. 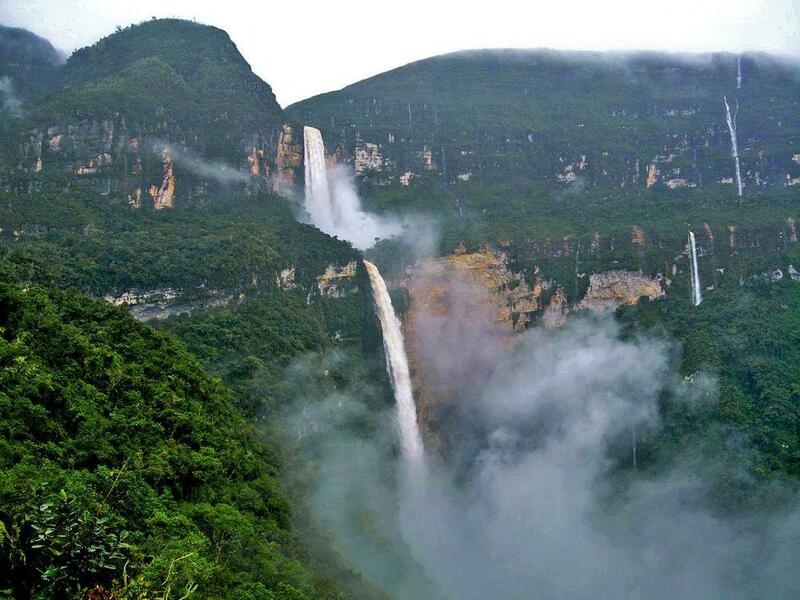 Gocta Falls (Catarata Gocta) – Amazonas. A very high waterfall with a measured height of 771 meters, in two drops. The tallest – lower drop is 540 m high. Tres Hermanas Falls (Cataratas las Tres Hermanas) – Ayacucho. This 12 meters wide stream has a total height of 914 meters in 5 drops. Yumbilla Falls – Amazonas. One of the highest waterfalls in the world. 4 vertical drops have a total height of 895.5 m. Low amount of water. Carancas impact crater – Puno. Site, where in September 2007 fell a meteorite. It created 4.5 m deep and 13.5 m wide crater. Some local people later became ill, the nature of this illness is not explained. Huayllay Stone Forest – Pasco. Amazing rock formations formed by erosion. Includes "forest" of stone needles, large natural arches, hoodoos and other formations. Marcahuasi – Lima. Mountain plateau with amazing granite formations, resembling large sculptures of humans and animals. Located at almost 4 km height, considered to be a place with mystical properties. Guitarrero Cave – Ancash. Site of early human settlement, inhabited since 8000 BC (possibly from 10,560 BC). Wall paintings and tombs from 1000 BC – 1000 AD, artifacts in extraordinary state of preservation, remnants of earliest cultivated plants in South America. Pikimachay – Ayacucho. Very early human settlement in a cave. Most scientists agree that the cave was inhabited 12,000 BC, but some even point at a possibility that it was inhabited 22,200 – 14,700 years ago. Found remnants of extinct camelids, giant sloths. Gran Pajatén – La Libertad and San Martín. Unusual prehistoric site, located on a hilltop. Consists of at least 26 circular stone structures, decorated with human, bird and geometric motifs. Developed since 200 BC, mostly built in Inca times by Chachapoya culture. Gran Saposoa – Amazonas. 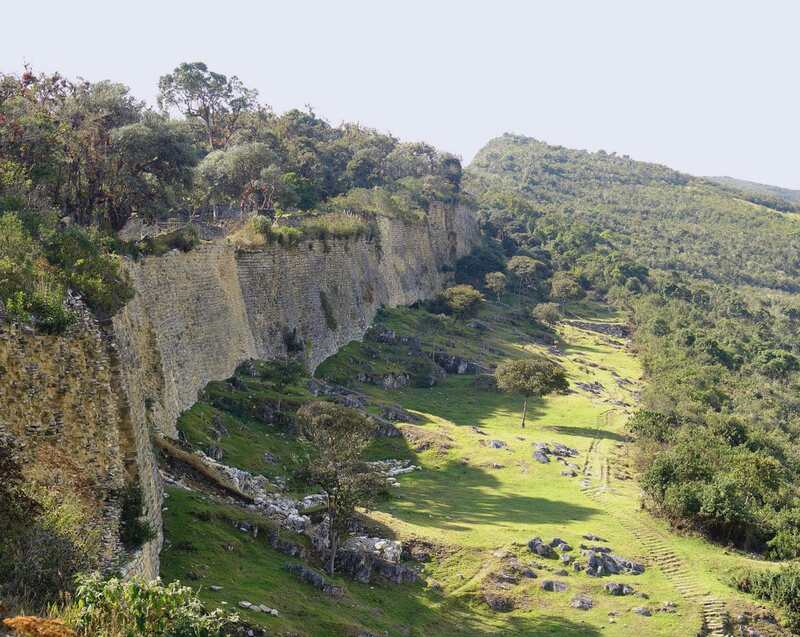 Enormous, little researched site of Chachapoyas culture with hundreds of circular buildings. Kuelap – Amazonas. Massive Pre-Columbian fortress with more than 400 buildings in it. This roughly 600 m long and 110 m wide fortress has up to 19 m tall walls. Constructed and inhabited from the 6th to 16th century AD by Chachapoyas culture. Caral – Lima. The oldest known city in Americas, inhabited somewhere between 2600 -­ 2000 BC. The pyramids in this city were built at the same time when pyramids were built in Egypt. The largest pyramid here though is 18 m tall. It is considered that this was a sacred city. Chan Chan – La Libertad. The capital of Chimor, the largest known Pre-Columbian city in South America, with some 6 km² large urban core. City was built from adobe, it flourished in 850 -­ 1470 AD. 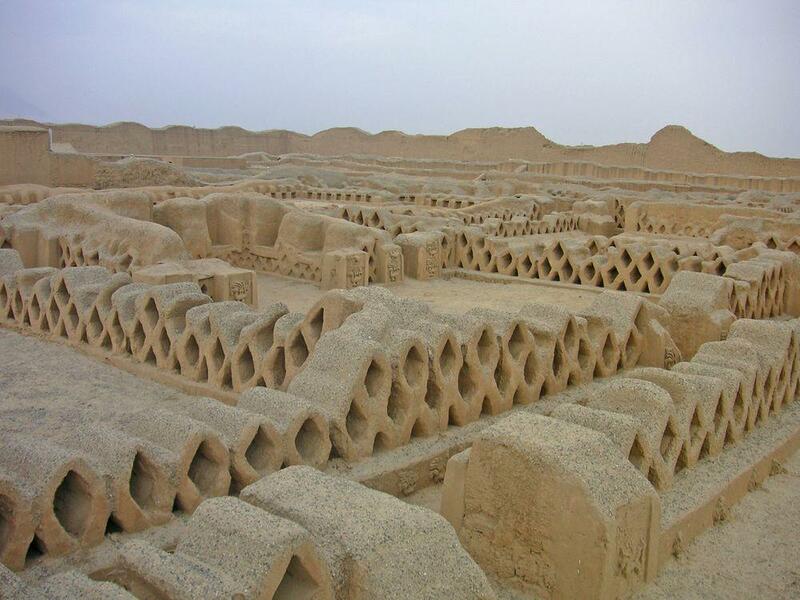 Chan Chan consists of 10 walled citadels and has many interesting features, including intricate ornamentation of adobe walls. Chankillo and Thirteen Towers – Ancash. Ruins of large prehistoric site, built by unknown culture around the 4th century AD. Thirteen Towers are a possible solar observatory – row of towers, forming a "toothed" horizon with certain intervals. Chavín de Huántar – Ancash. The former capital of Chavín culture, a place of high spiritual importance. Occupied since at least 3000 BC, sacred site since the end of the 2nd millenium BC. Site contains numerous diverse temple structures and amazing artworks including the sculpture of the 4.53 m tall Lanzón, created some 3000 years ago. During the rain the channels under the temple create a sound which was similar to a roar of jaguar. Marcahuamachuco – La Libertad. Ruins of once most important urban center in Peru, built in 400 – 800 AD. Built on isolated mountain plateau. Pachacamac – Lima. Ruins of large city, built by Pre-Inca culture, flourished in 800 – 1450 AD. Developed by several cultures – Huari, Inca. Here are at least 17 pyramids. Valuable fresco from 200 – 600 AD. Túcume pyramids – Lambayeque. Group of 26 major pyramids and mounds in an area of 220 ha. Ceremonial center – and, possibly, a capital of Sican, Chimu and Inca around 800 – 1532 AD. Wari Ruins – Ayacucho. Ruins of the 16 km² large capital of Wari empire, flourished sometimes around 500 – 900 AD. Choquequirao – Cusco. Ruins of an abandoned Inca city, located in dramatic mountain setting. Built in the late 15th century. Site includes a mountain with truncated, leveled top, dramatic agricultural terraces. Machu Picchu – Cusco. One of the most spectacular archaeological sites in the world, an Inca town. 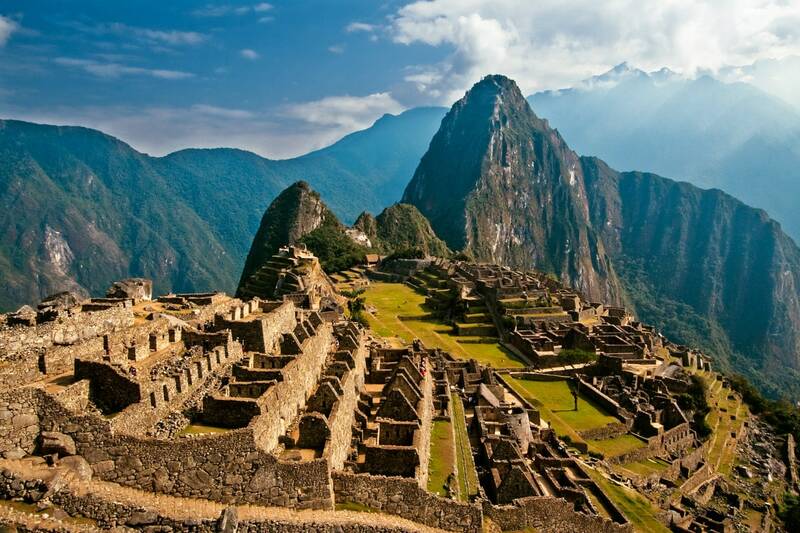 Machu Picchu is located on rugged cliff peak and consists of extensive ruins of stone structures. It is believed that the town was built around 1450 as a shelter and center for Inca rulers – and abandoned sometimes around 1572. Especially interesting monument here is Intihuatana – a sculpted stone, possible astronomic clock or calendar. Another amazing monument is a cave – Temple of the Moon in the nearby Huayna Picchu. Moray – Cusco. Ruins of an unusual Inca village with several enormous, circular, terraced depressions. There exists hypothesis that this was an experimental field to test different crops. Patallacta – Cusco. 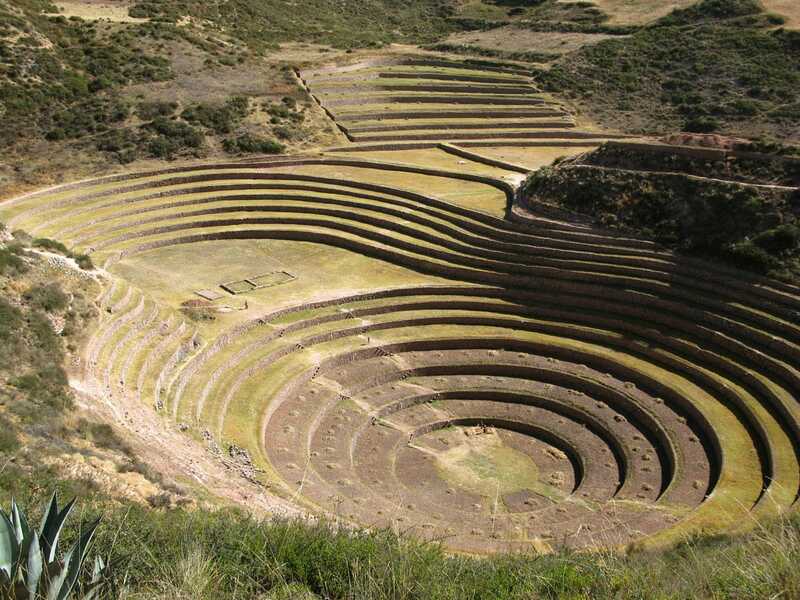 Well preserved ruins of Inca village, with magnificent system of agricultural terraces around it. Vilcabamba – Cusco. Ruins of the last capital of Inca. This remote mountain refuge was constructed by Manco Inca in 1539 and fell to Spaniards in 1572. Rediscovered in 1892. Mollepunco Caves – Arequipa. Group of small lava caves, adorned with prehistoric paintings, showing the domestication of alpaca. Drawings were created around 6000 -­ 3000 BC. Tombs and different artifacts. Pusharo Petroglyphs – Madre de Dios. Large and unique petroglyph site in Manú National Park. Stone carvings cover large cliff face and most likely were created by some Amazonian culture. Tambolic caves – Amazonas. Caves with more than 10,000 cave paintings more than 6,000 years old. Toquepala Caves – Moquegua or Tacna. Cave with expressive group of some 7,650 years old paintings. 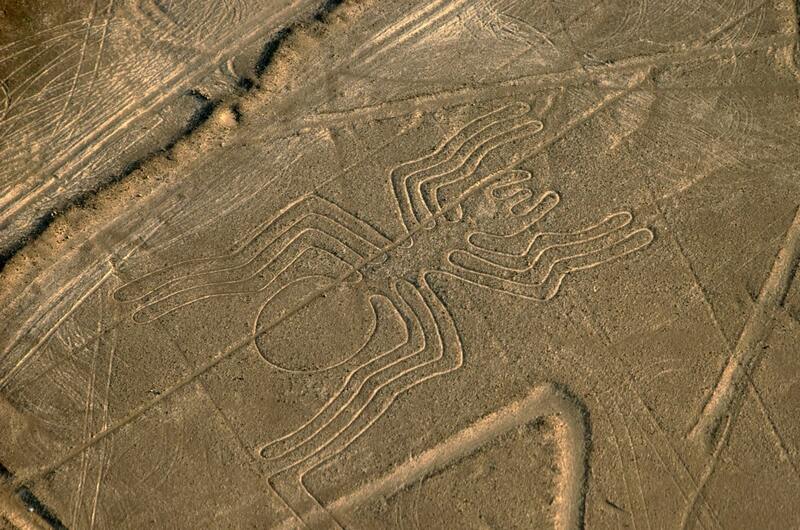 Nazca Lines – Ica. The best known geoglyphs in the world, created sometimes around 400 – 650 AD in the extremely dry Nazca Desert. Giant, up to 200 m long prehistoric drawings are spread over large area, the best among them are Family, Mandala, Tree, Spider, Condor, Astronaut, Whale. Numerous are the rectangular areas and lines. Paracas Candelabra – Ica. Prehistoric geoglyph on the slope, well visible from the sea. This 185 m long figure most likely has been made sometimes around 200 BC. Laguna de las Momias – Amazonas. Breathtaking archaeological monument – a necropolis hewn into a high cliff overlooking a lake. In mausoleums still are located numerous remains of deceased. People here were buried in seated position, wrapped in intricate textiles. Revash necropolis – Amazonas. Group of artificially excavated cavities in a deep canyon, made by Chachapoya culture. Used as burial sites, often very well preserved. Adorned with cliff paintings, other valuable artifacts. Sarcofagi of Carajía – Luya. A group of unique, practically intact clay sarcophagus. Seven sarcophagi are shaped like standing people and are up to 2.5 m tall. Sillustani chullpas – Puno. Group of impressive burial towers – chullpas. Built by Aymara people before the 15th century AD, the best preserved chullpas. Cahuachi – Ica. Important ceremonial center of Nazca culture, built approximately in 1 – 500 AD. Contains some 40 mounds with adobe structures on their tops. Most likely used as a pilgrimage center. Huaca Pucllana – Lima. Giant temple – a pyramid with seven platforms, built and used roughly in 400 – 700 AD. Structure is up to 22 m high and 500 m long. Pyramids of Sun and Moon (Huaca del Sol and Huaca de la Luna) – La Libertad. One of the largest adobe structures in the world. Located in the former capital of Moche state. Built sometimes around 450 AD. Pyramid of Sun initially was 50 m tall, now 41 m tall. Qenko – Cusco. Holy place of Inca, with artificially shaped limestone blocks. Includes gnomons – sundials and intricate incised lines – "snakes". Ushnu temple, Vilcashuamán – Ayacucho. A preserved Inca temple – a stone structure in a form of truncated pyramid. Contains a Seat of the Inca – large stone with unique carvings. The nearby Vilcashuamán is still inhabited Inca town with many ruins of ancient buildings. Ventarrón – Lambayeque. Ruins of an enormous, very ancient temple, built sometimes around 2000 BC. Adorned with well preserved, interesting murals. This amazing structure shows that even 4000 years ago here was a very developed culture. Aramu Muru – Puno. Giant stone carving in live rock, most likely unfinished. Represents a giant gate, which leads into cliff. Local stories about portal leading to the world of spirits. Sayhuite monolith – Apurímac. Large rock with more than 200 geometric and zoomorphic bas reliefs. Located in an ancient center of religious worship. Yurak Rui – Cusco. 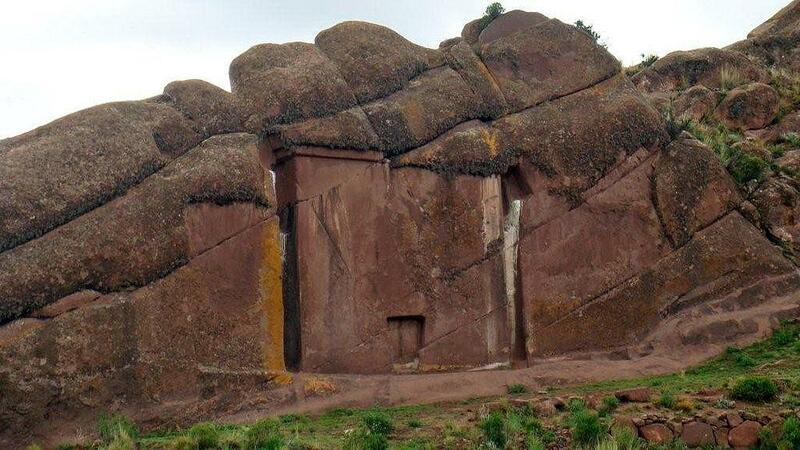 Giant sculpted rock with specially shaped surrounding landscape, created by Inca. Cumbe Mayo – Cajamarca. Some 8 km long aqueduct, built roughly in 1500 BC. Aqueduct and surrounding cliffs are adorned with many petroglyphs. Inca Bridge – Cusco. Amazing construction by Inca, making the access to Machu Picchu very hard. Consists of amazing rock cut pass along a vertical cliff and tree trunks, which crossed 580 m deep chasm. Tree trunks could be cut, thus closing any possibility to cross the chasm. Sacsayhuamán – Cusco. One of the most impressive complexes of megalithic walls with blocks up to 120 – 200 tons heavy: possibly built by Kilke culture between 900 – 1200 AD. Ruins of temples found. 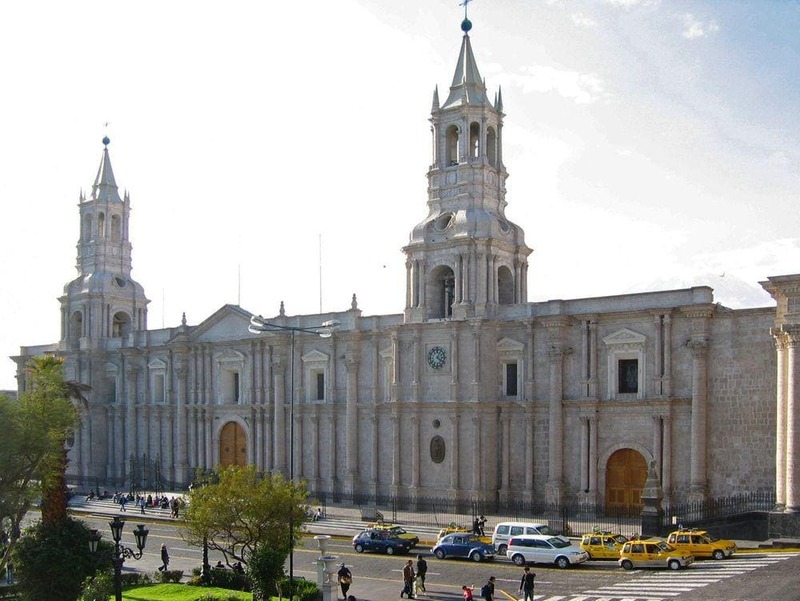 Arequipa Historical Centre – Arequipa. The historical centre of this colonial city has been well preserved and contains more than 500 valuable historical buildings. City was founded in 1540 and is built mostly from a white volcanic rock. Cajamarca Historical Centre – Cajamarca. Ancient town, important centre of Inca Empire, now – a beautiful historical city with numerous ornate buildings. Notable buildings include the Ransom Room – place where Inca Emperor Atahualpa was held captive and which was filled with gold and twice with silver – ransom. Town contains many other interesting monuments of Inca culture. Cusco – Cusco. The historical capital of Inca Empire, inhabited since 900 AD. 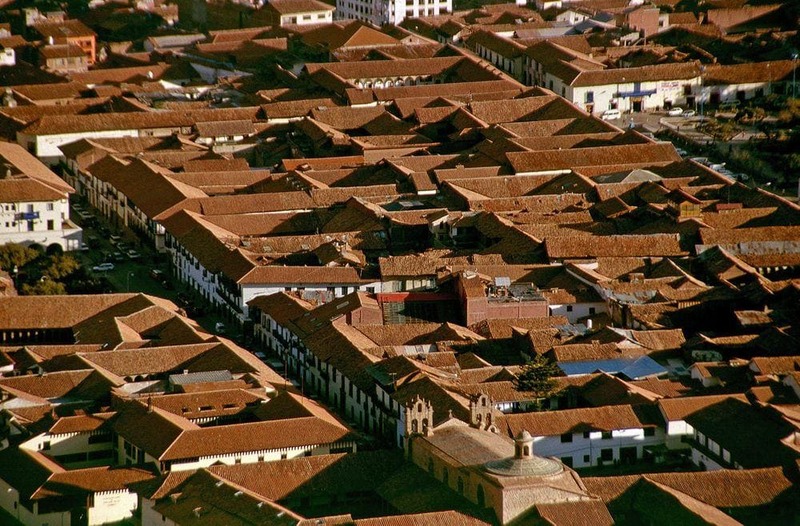 During Inca time (the 13th century – 1532) the city was developed according to a strict plan. After the Spanish conquest the city has maintained much of its original planning and part of building stones, but there has been built a new, magnificent city, blending local and European traditions. Amazing is Hatun Rumiqoc – a street going along the wall of Inca palace, with the amazing stonework (including the famous 12-angled stone) preserved. Lima Historic Center – Lima. One of the first major European urban centers in Americas, founded in 1535. Many buildings are sumptuous and ornate, showing off the wealth of Peru in Spanish colonial times. At time even the streets were paved with silver bars here. Characteristic feature is more than 1600 ornate balconies. Ollantaytambo – Cusco. Inca site – royal estate of Pachacuti. One of the oldest continuously inhabited towns in Southern America. This Inca town and ceremonial center was built in the late 15th century and many original Inca buildings are still inhabited. The ruins of the Sun Temple on Temple Hill include a Wall of Six Monoliths – surprising megalithic structure. Trujillo Historical Center – La Libertad. Trujillo was established in 1534 and the historical center of this city has been well preserved. Many houses have characteristic wrought iron window railings, the interior halls often have sumptuous design. Basilica Cathedral of Arequipa – Arequipa. Enormous, unusual cathedral building, built in 1609 – 1656 in Baroque style. Cathedral of Santo Domingo – Cusco. Large, impressive cathedral in Gothic – Renaissance style, built in 1559 – 1654. It serves as a repository of many relics and archaeological artifacts. Built on the foundation of Kiswarkancha – Inca temple. 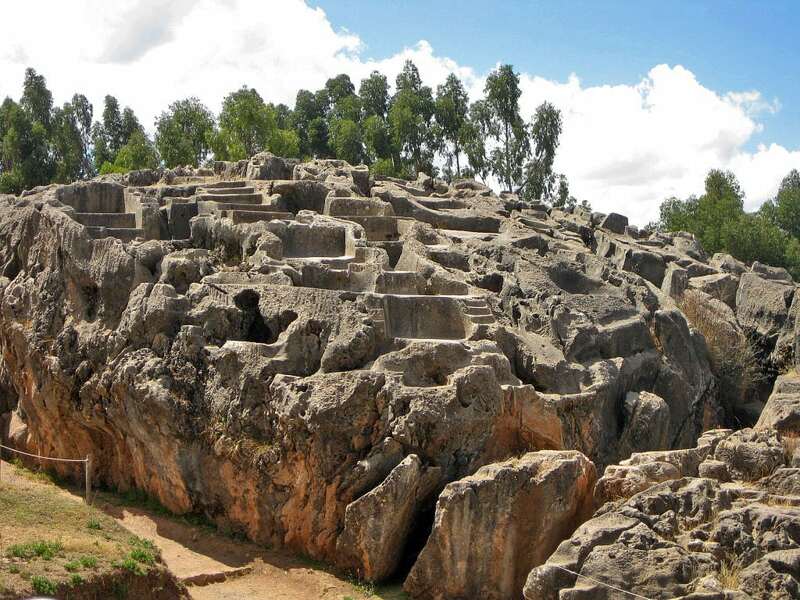 Stones for cathedral were taken from another Inca site – Sacsayhuamán. Church of the Society of Jesus, Cusco – Cusco. Magnificent Renaissance – Baroque style church, built in 1571 – 1668. La Merced Convent in Cusco – Cusco. Outstanding monument of Baroque architecture and art, this monastery was first established in 1536 and rebuilt after an earthquake in 1675. Valuable are the paintings and wood carvings in its cloisters. Monastery of San Francisco (Convento de San Francisco) – Lima. One of the largest monasteries in the world, with many buildings and artifacts of huge importance. Church and monastery were consecrated in 1673, completed in 1774. Buildings represent a fine example of Spanish Baroque architecture. Library of monastery contains very valuable antique texts. Amazing catacombs. Triunfo Church – Cusco. The first church in Cusco, built in 1536. This ornate Renaissance style building is built over Suntur Wasi – Inca armory. Archbishop’s Palace of Lima – Lima. Sumptuous building, constructed in 1924 in Neo-Colonial (Neo-Baroque) style. Keshwa Chaca – Cusco. The last Inca rope bridge, crossing Apurimac River. This woven grass bridge should be changed every year. Peru is one of the most interesting and diverse countries in the world. Many landmarks here are unique, without analogues in the world. Archaeological heritage – Peru in this respect is one of most interesting countries in the world. This country has seen rise of numerous ancient cultures, such as Chavín, Paracas, Moche, Nazca, Wari, Chimú and the last and best known – Inca. Here developed the most ancient urban centres in Americas (Caral: 2600 -­ 2000 BC), very large cities (Chan Chan, Cusco). Here were built very large structures – giant pyramids, amazing monolithic carvings and unsurpassed megalithic structures (Sacsayhuamán). Historical cities and colonial architecture – when Peru was conquered by Spaniards, quickly were developed new cities with rich colonial architecture. Some cities retained Inca and earlier planning and even buildings and now represent a unique blend of urban planning and architecture (Ollantaytambo, Cusco, Cajamarka). Historical cities have very impressive churches and monasteries – most impressive could be Cathedral of Santo Domingo and Compania de Jesus Church in Cusco. Canyons – some of the deepest canyons in the world are located in Peru – only in Himalayas are located deeper ones. Cotahuasi Canyon is up to 3,535 m deep. Waterfalls – in Peru are located some of the tallest waterfalls in the world. Tres Hermanas Falls are 914 m tall, with 5 drops. The tallest drop of Gocta Falls is 540 m high. Biodiversity values – Peru is one of most biodiverse countries in the world, here are located areas with the highest diversity of butterflies, one of the highest diversities of mammals and birds, plants. It is though hard to single out a single area with very distinct, unique ecosystem. 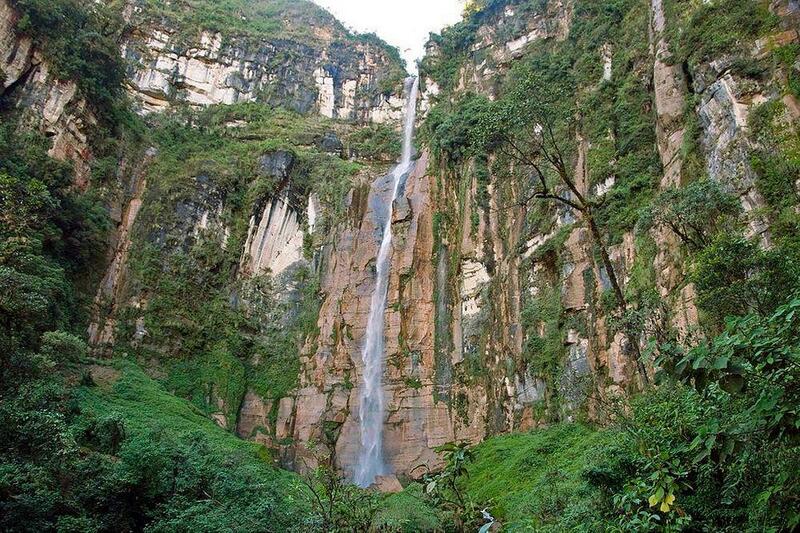 Some of the highest waterfalls are found on the eastern descents of Andes in Amazonas Region, Peru. The 895.5 m tall Yumbilla Falls are the fifth tallest in the world. In 1911, Hiram Bingham III climbed into the Andes Mountains of Peru and “discovered” Machu Picchu. While history has recast Bingham as a villain who stole both priceless artifacts and credit for finding the great archaeological site, Mark Adams set out to retrace the explorer’s perilous path in search of the truth—except he’d written about adventure far more than he’d actually lived it. In fact, he’d never even slept in a tent.